Two people were hurt in a shooting early this morning. And separately, the Bangkok residence of Democrat leader Abhisit Vejjajiva was hit with a small explosive device. The Thai stock exchange moved some staff to another location after demonstrators threatened to take control of its offices. Prime Minister Yigluck said the Feb. 2 elections will go ahead. Gunshots rang out in the heart of Thailand’s capital overnight in an apparent attack on anti-government protesters early Wednesday that wounded at least two people and ratcheted up tensions in Thailand’s deepening political crisis. 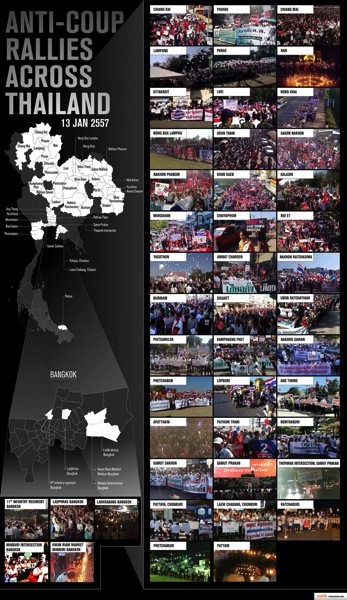 Most of Bangkok remains unaffected by the latest wave of rallies. But the shooting was the latest in a string of violent incidents that have kept the vast metropolis on edge amid fears the country’s deadlock could spiral out of control. Bangkok’s emergency services office said one man was hit in the ankle and a woman was hit in the arm in the shooting, which occurred on a street leading to one of Bangkok’s glitziest shopping districts that has been occupied since Monday by camping demonstrators trying to bring down Prime Minister Yingluck Shinawatra’s government. Sompong Pongsattha, a 56-year-old resident who witnessed the attack in the Pathumwan district, said about 30 gunshots were fired from an unknown location toward a protest barricade over the course of about two hours. In another incident overnight, a small explosive device was hurled into a residential compound owned by former Prime Minister Abhisit Vejjajiva, shattering windows and slightly damaging a roof, according to Police Col. Chumpol Phumphuang and Abhisit’s opposition Democrat Party. No injuries were reported, and Abhisit — who resigned from Parliament last month to join protesters — was not home at the time. Thailand’s stock exchange moved some personnel Wednesday from its main building to a shopping mall following threats to seize the premises by antigovernment protesters who have tried to shut down areas of central Bangkok. Thailand’s government stuck to a plan for a February election on Wednesday despite mounting pressure from protesters who have brought parts of Bangkok to a near-standstill, and said it believed support for the leader of the agitation was waning. Some hardline protesters have threatened to blockade the stock exchange and an air traffic control facility if Prime Minister Yingluck Shinawatra does not step down by a deadline media said had been set for 8 p.m. 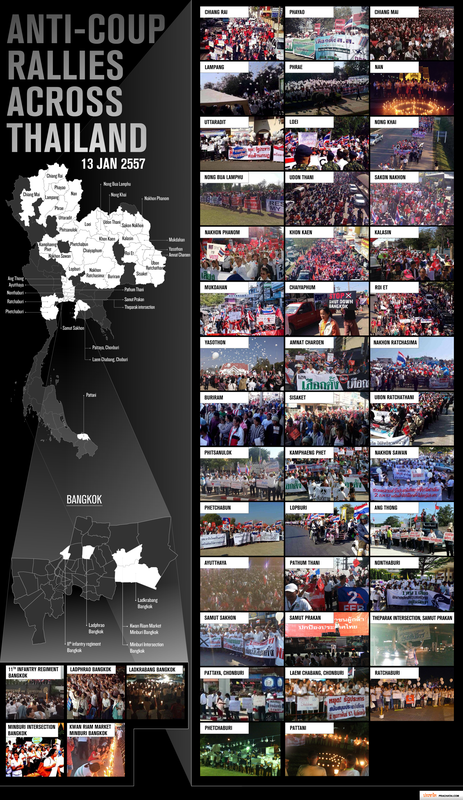 Meanwhile, Prachatai has a map of “anti-coup” rallies that took place around the country on Monday, the day “Bangkok Shutdown” began. A bigger version is here. Blog posts will be sporadic in the days ahead, but as always, you can find me on Twitter for more frequent updates. ‘Bangkok Shutdown’ update: Court says government can delay Feb. 2 election — but will it?